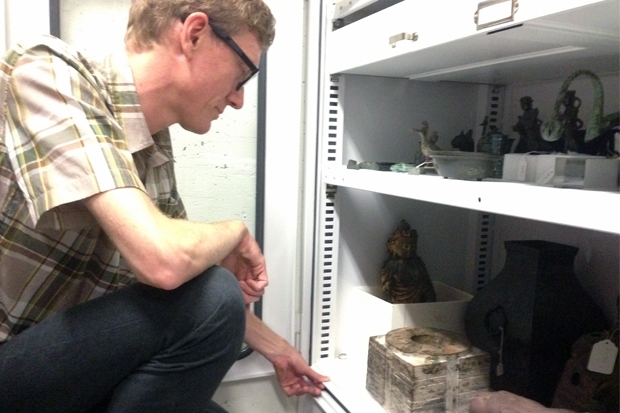 In July, artist Andy Graydon was in the museum vault, examining a 5,000-year-old Chinese jade block, or ts’ung, an object he is considering including—through words—in his upcoming installation Fig. 1, opening in February. Funded by a Laila Art Fund grant, Graydon was at the museum doing initial research and laying the groundwork for his project, which focuses on the relationship between media and environment. The work for two-channel sound will be made for the Honolulu Museum of Art and its environment. The only “material” Graydon will use is the sound of two voices, one describing two sets of objects, such as the stone Chinese bowl—in exacting detail in English, the other describing the objects in Hawaiian. The actual objects will not be on view. Also included in the project will be a performance and workshop. Born and raised on Maui (his mother was a public school teacher and his father is an editor who founded the defunct Maui Sun), and now living in Cambridge, Mass., Graydon is a sound and media artist whose work has been featured in exhibitions at New York’s New Museum, the Berlinische Galerie, the Portland Art Center, and the Kunsthalle Exnergasse in Vienna, among many other venues. After seeing Graydon’s photographs two years ago, museum deputy director Allison Wong got in touch with him and invited him to visit the museum the next time he was in the islands. “Eight months later, in May 2013, I was coming to visit family. Allison and I talked a lot about sound, because my work started in film and video, then I got interested in sound,” said Graydon, taking a break from his project research in the museum collection. In subsequent conversations, Wong raised the idea of sound in relationship to public art, and also talked about Graydon’s interest in sound and its relationship to place. While Graydon has never done an installation quite like this before, it does have its roots in The Findings, a film that was on view at the Frye Art Museum in Seattle earlier this year.